Whenever a game starts its story with a human sacrifice to a volcano, you wonder what it is that you’re in for. That’s how I felt when I booted up God Wars: The Complete Legend for the first time and jumped head first into this interesting story. There are a lot of characters you get introduced to in just the first few scenes. I ended up grabbing my notepad and writing some things down in case they became important to remember. I really felt that one of the revolting villagers early in the story had the most compelling name: Mature Farmer. What does that even mean and what were his parents thinking when they named him? Since I’m a huge fan of tactical RPGs, I was excited to get into this one. Despite having a long history playing them, each one is often a bit different and true to form there is a lot to take in with this title, so I feel there is more of a learning curve to it. After playing for a bit I got to appoint where I began having loads of trouble trying to get through battles. I must not have been paying attention because the problem was on my end: I wasn’t upgrading my attacks or abilities. Once I did that the game began to click and I was having a smashing time. The developer likes to give the players total control over every facet of your characters, so you get to choose how to mold each one. That’s not to say that there’s not some helpful automation here. In fact, the game will select the items that would be beneficial for each fighter depending on if they’re going to be in an attacking or defensive position and which row they’ll be in. Still, if you are the type that likes to micromanage everything, there is a lot of micro to manage. While there’s a lot to learn and figure out, I always had a fun time in combat and it never became too frustrating or overwhelming. The battle system is excellent and there are a few bits that I feel obligated to point out. First, there are a lot of different ways to attack your foes. If you want to focus on ranged attacks, hand to hand combat, magic, or whatever you have that option with every play. Like many tactical games you can decide to use a skill or item, attack, throw something, or brace yourself and defend. You can select each enemy that you are facing, see how many moves they can make, how far they can jump, and what they’re resistant to. There are 12 items in the stats column and 12 items in the resistances column. Stats include their attack power, defense, magic attack and so on. The resistances are your ability to fight off things like poison, slow, and blur. These are all explained as you play but can be a bit confusing as you start. A nice touch, and something done in other games as well, is being able to cycle through each character with the left and right buttons and not having to back out very far to change that you’re selecting. When we bring tactics into the mix, it becomes a bit like playing chess and you’ll want to anticipate what your enemies will do and set yourself up for the best possible outcome. Part of your strategy may include investigating all the chests and sparkling squares. Some are traps and others will give you an item that will help you along the way. Each battle has a goal or condition that must be met to earn a victory. These consist of many things, and could be as simple as defeating all of the enemies on the board or defeating just one specific foe like a captain. Before I made a move, I was looking at each character and trying to anticipate how far they’d react or move on their turn. Terrain plays a role in strategy as well since higher ground positions grant bonuses (for every x amount of height you are above your target you get n amount more range) and the opposite is true of the guy at the bottom of the hill. Maintaining higher ground can be the difference between an easy victory and a hard fought one. I like this feature in tactical games because it adds one more layer to the through process and adds a dash of realism to the mix as well. There is a feature that I don’t recall seeing in any tactical game I’ve played called Impurity. As you battle, each character will build impurity for taking an action during battle. This impurity puts a target on your character. The opposition will attack your character with the highest impurity. Some characters will have a skill that will purposely pad their impurity so that they can draw the ire of the enemy forces. This is good if your defensively weak priests or what have you are building up a lot of impurity, you can draw the enemies away from them and have them focus on one of your stronger characters. There are also skills that will bring that impurity down so the outcome is the same. Each character has a job like the aforementioned priest. You can be a warrior, magician, or one of many vocations you will find along the way. Each character can also have a sub job and when you perform a skill attributed to the job, you gain experience and level it up to learn more skills. If you have the optional sub job chosen, then you get the skills available for that and can use those to level that job up at the same time. Effectively powering up your allies is essential to victory and it’s fun to boot. God Wars won’t wow anyone in the graphics or audio departments, but there’s nothing offensively bad here either. You do get some nice animé cinemas here and there, and the opening scene does bring the feels. The music is decent, but nothing great and the voice acting is subpar. You do have the choice to turn on subtitles if that’s more your speed. Some of the voices sounded like people they rounded up around the office to read scripts. If they could read and speak at the same time they made the cut. Again, Mature Farmer was just an amazingly bad voice actor that deserves to be mocked and ridiculed. Having said that, the main cast of characters seems to feature slightly better acting, but the supporting roles bring it down a notch. All in all, if you’re a fan of the Tactical RPG like I am, I think you will find many things to like in God Wars. There are three difficulty settings so if the game feels a bit easy for you, you can crank up the difficulty a notch. If you have been wanting to get into Tactical RPG games, this one may not be a bad place to start. On one hand the game isn’t overly difficult, but on the other hand there’s a bit of a learning curve and it throws a lot at you at the start. I wouldn’t say this is the best TRPG I’ve played, but it’s much better than average. Having it on the Switch is a nice touch because these games often lend themselves to the handheld screen. 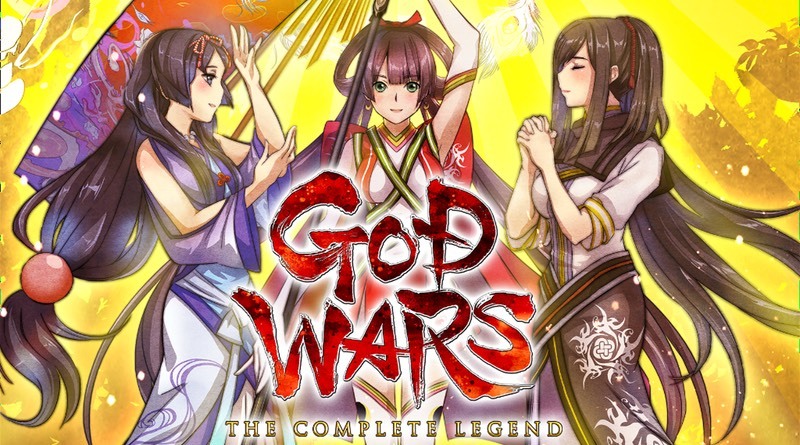 God Wars: The Complete Legend was reviewed using a final retail Nintendo Switch download code provided by the publisher.